As the month of February is winding down, I’m starting to look forward to spring, warm weather and fresh produce from my garden. I start to really miss gardening this time of year but I’ve recently discovered an easy way to get fresh tasty vegetables into my diet, even in the middle of winter. Ok, maybe that’s not a mind-blowing epiphany. I’ve grown sprouts for years using a simple mason jar. They’re delicious and packed with nutrients . I love them on salads, in sandwiches and in my green smoothies. But, my very small house doesn’t have room for more than one jar of sprouts at any given time. Plus, there’s usually a 4 to 5 day wait between crops. 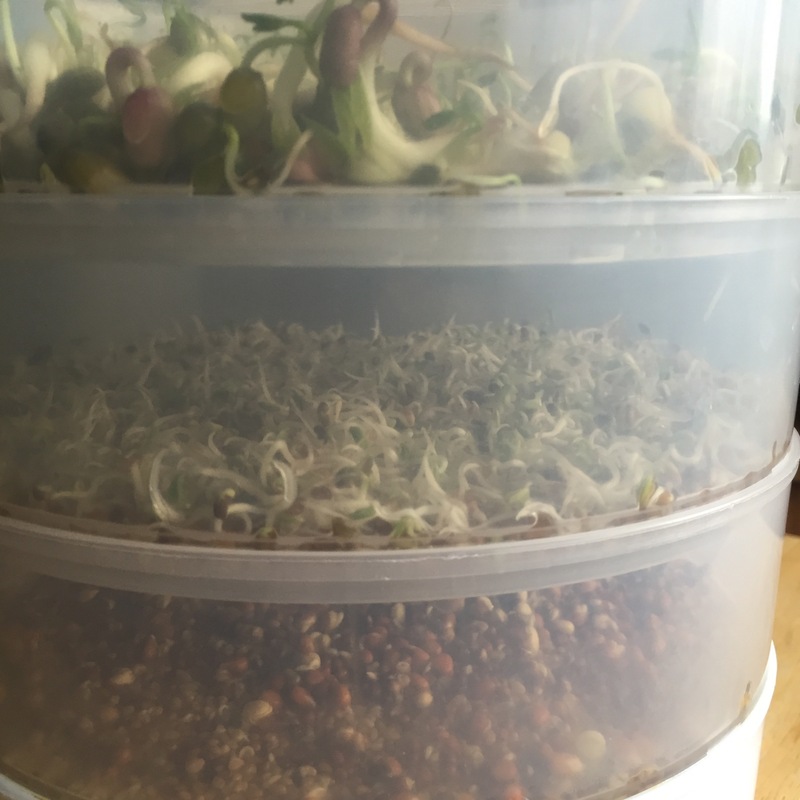 As I was looking for alternatives to using a jar, I ran across the concept of using a multi-tray system that lets you stack 4 trays of growing sprouts on top of one another. Each tray has drainage holes to making watering the sprouts easy. Growing vertically helps make the most of small spaces and using 4 trays at the same time increases your yield. Growing sprouts indoors couldn’t be easier, even for the green-thumb challenged. First, soak your sprout seeds for several hours. This helps them draw in water and activates the growing process. Once they’ve soaked, rinse them a few times with clean water. I use the trays for this since they have drainage holes. 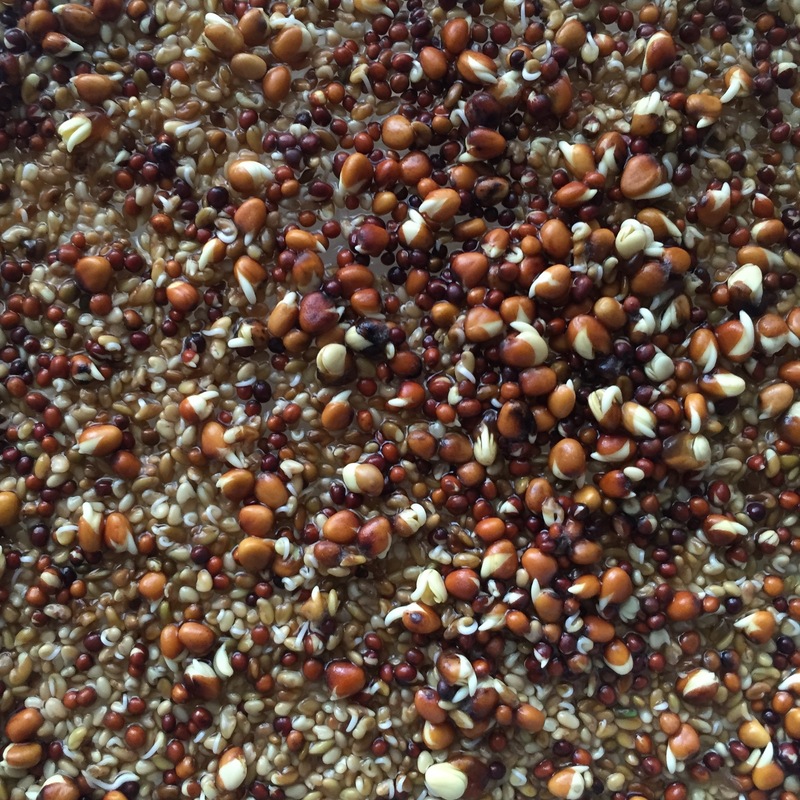 Spread the seeds in the trays, then stack your trays on top of the catch basin. Water them at least twice a day. Each time you water, move the bottom tray to the top so that each tray gets a chance to be watered first. You can de-hull the sprouts or, if you don’t mind the slightly bitter flavor, you can leave the hauls on. To de-haul, fill a bowl with water then place sprouts in the bowl and start to break apart the clumps. The hulls will either fall to the bottom of the bowl or float on top of the water (in my experience, it depends on the variety of seeds). If they fall to the bottom, you can skim your spouts out of the water. If they float, skim the hulls and discard them, then remove the sprouts from the water. Whether you choose to de-hull them or not, use cool clean water to thoroughly rinse them. Dry them well with a few paper towels and eat them right away (I usually can’t wait) or store them in the refrigerator. My trays came with a lid so I can store my sprouts right in the tray. The beauty of this system is you can either start 4 crops of spouts at one time or you can stagger the start date and have a continuous supply. I’m currently using the Victorio 4 tray sprouter and I love it for it’s a small footprint. It takes up almost no space! Growing sprouts has given me a fun, easy way to satisfy my love of watching things grow this winter. And as a bonus, I’m eating more healthy salads so I can use up all the sprouts I’m growing. I’ve grown broccoli, alfalfa, mung bean, red & green lentils, and I’m currently soaking a mix of adzuki, gamut and fenugreek seeds. 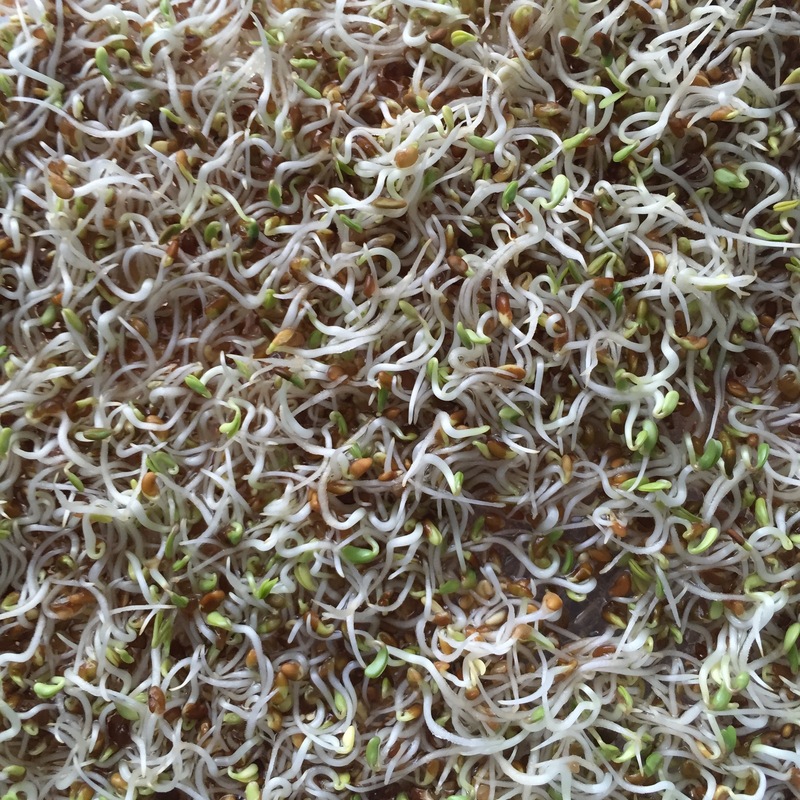 Have you tried growing your own sprouts? What are your favorite varieties? P.S. The opinions in this post are completely my own. Victorio has not compensated me in any way to talk about their product. I successfully picked, peeled, washed and dried two loofah before the snow started to fall here in Ohio. Sadly, the rest of the loofah didn’t dry out before the temperatures plummeted. Isn’t that a lovely picture of dried loofah sponges? I wish I could take credit for growing these but alas, my loofah are still as green as can be. Well, all of them except for this monstrosity. Apparently someone got too busy and neglected her garden for a few weeks. This is not what I intended when I started this project but I’m not about to let a little setback deter me. In the spirit of Halloween, I’m calling this a zombie loofah. If you or someone you know is a zombie who needs a little exfoliation, drop me a line and this little gem is all yours. After all, zombies deserve smooth skin, too. Loofah sponges are supposed to dry on the vine but since the weather is getting colder and mine are showing no signs of starting to dry out, I decided to take matters into my own hands. 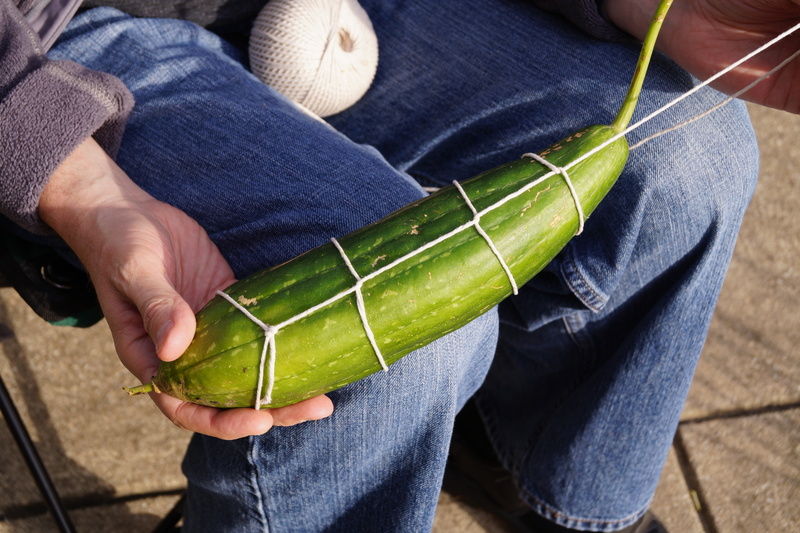 I removed one of the loofah from the vine and enlisted the help of a former Boy Scout to string it up like a Thanksgiving turkey. It is now hanging from a rafter in my garage. I’m really itching to make a soap using loofah. For now, all I can do is be patient and let nature take its course. Did you miss out on some of the loofun? 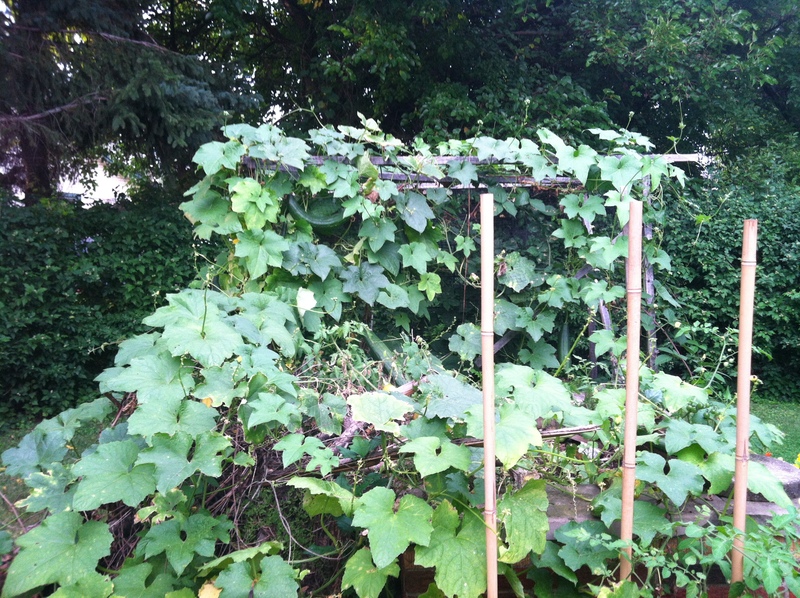 Check out some of the prior installments of the experiment to see loofah baby pictures, wild vine growth or try a new recipe. When Matt and I are looking for something to do, we often search for botanical gardens in the area. There’s no better way to get inspiration for my own garden than to check out what the pros do. 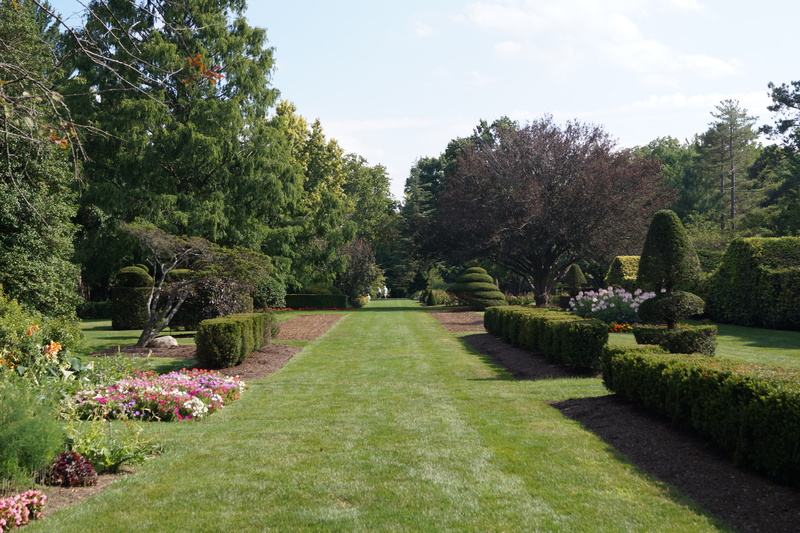 The other day, I ran across Schoepfle Gardens, a 70 acre park that is part of the Lorain County Metro Parks system. The founder, Otto Schoepfle, sounds like my kind of guy. He had a passion for continued learning throughout his life and according to the information on the Metro Parks site, he went to Europe several times to learn about new plants and then came home to apply what he had learned in his garden. I imagine Otto as a great lover of nature and this statue of him conveys that perfectly. 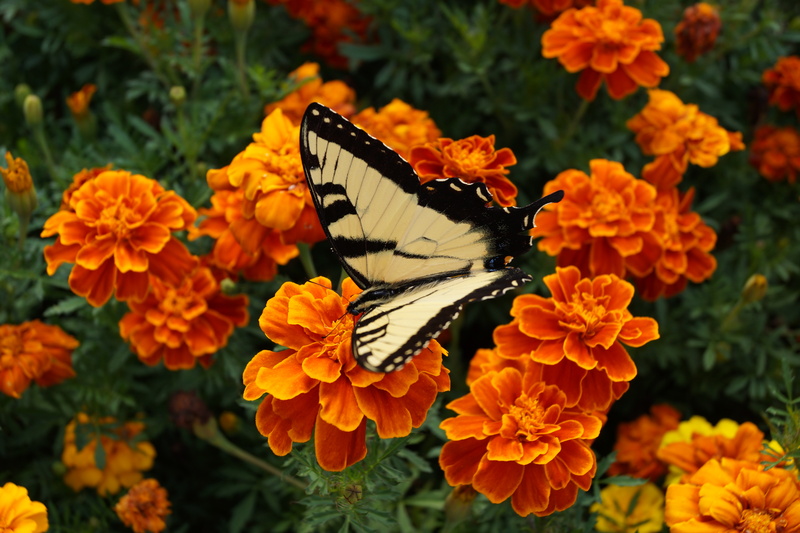 Look closely to the left and you can see a butterfly flitting above the flowers. It’s as if his outstretched hand is summoning the butterflies and woodland creatures to him. 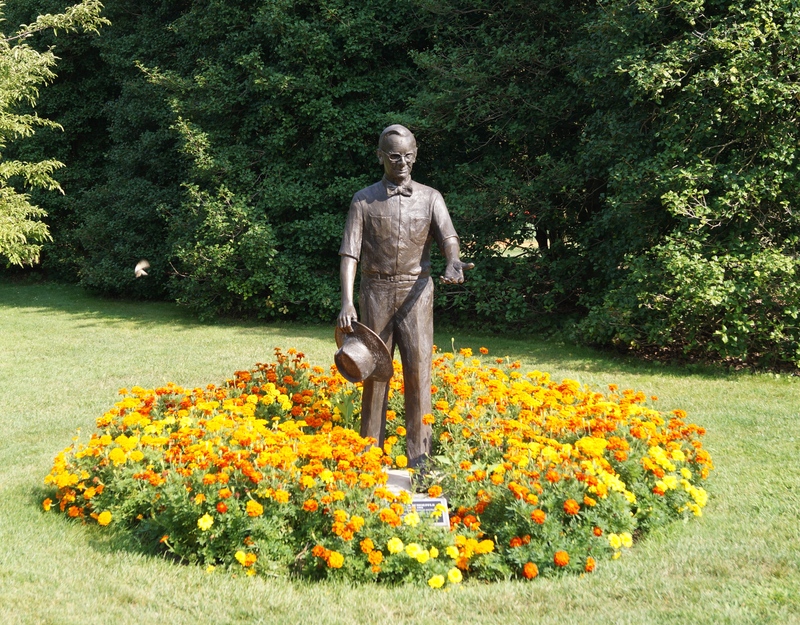 Otto lived and worked on the grounds from 1936 until his death in 1992. That’s 56 years of hard work, sweat and dedication. He set up a trust and donated the acreage to the Lorain County Metro Parks in 1969 but he continued to live in the family home, located on the grounds, until his death. One of the most impressive specimens on the property is the Dawn Redwood tree. 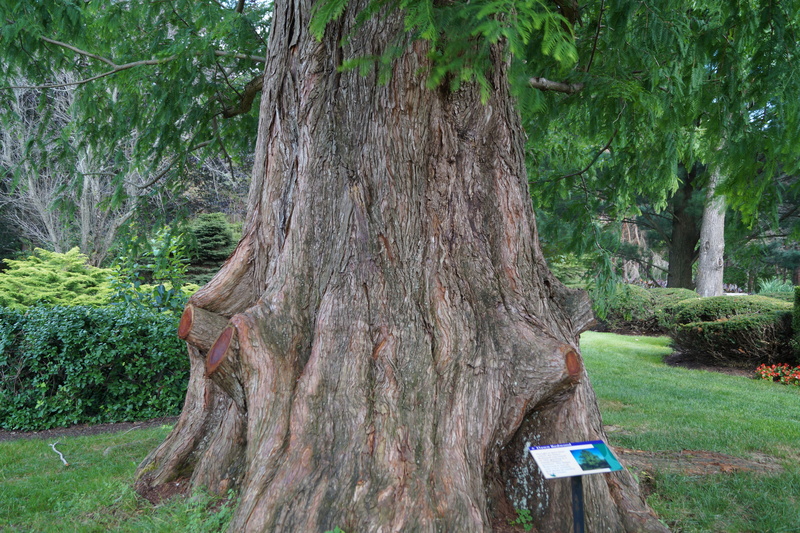 According to the placard, the Dawn Redwood was once thought to be extinct. It was rediscovered in China in the 1940s. Otto went to China and brought back two seeds. This tree is from one of those seeds. Over the years, Otto received help from volunteers in the community and he loved working with local children. 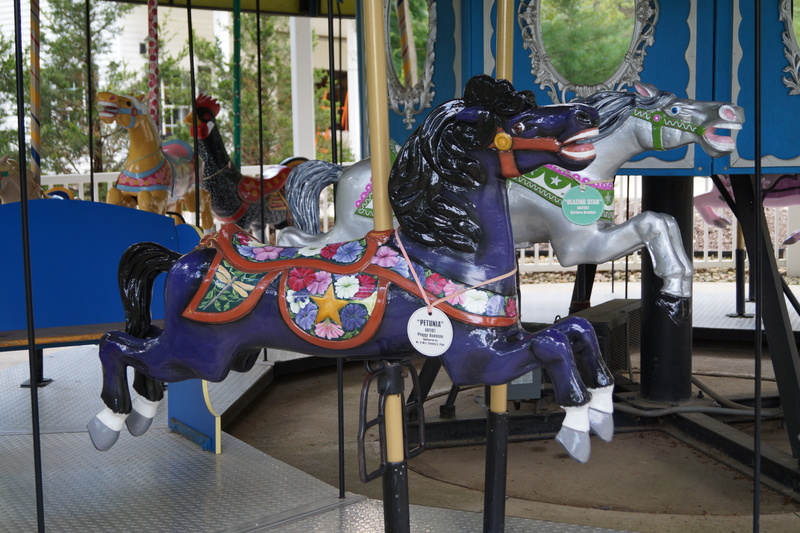 In 2007, a music themed children’s garden was added along with a carousel. 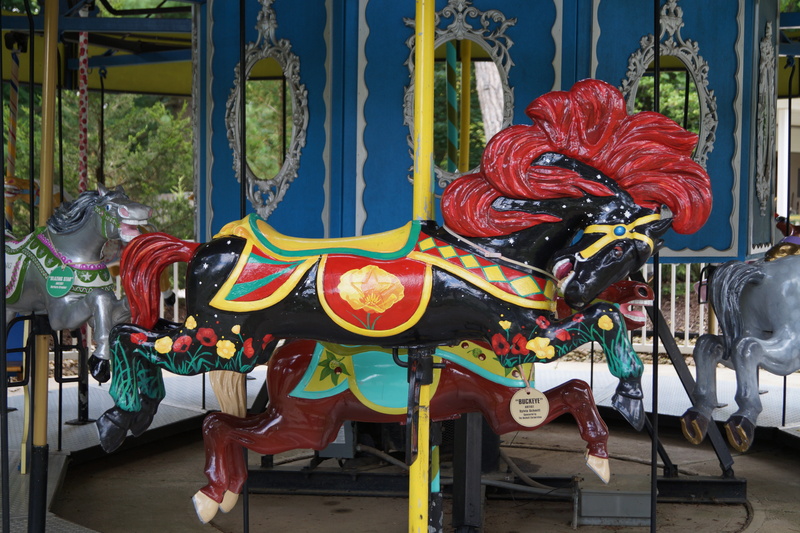 The horses and animals were refurbished by local artists and are stunning. 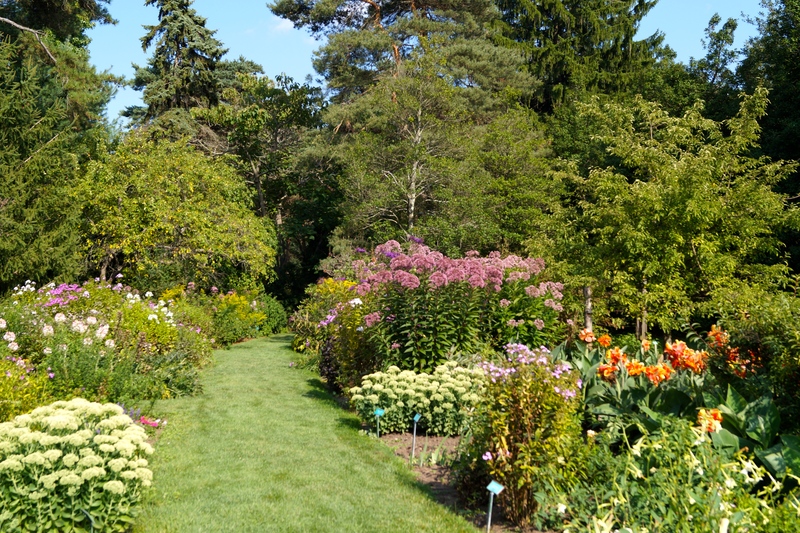 If you live in Ohio and love nature and gardening, Schoepfle Gardens is a must see. If you don’t live near by, you can take a virtual tour, narrated by legendary Cleveland newscaster Leon Bibb, here. Want to read more about the history of the Dawn Redwood? There’s a short yet fascinating story here courtesy of the good people at dawnredwood.org. Know of any must see botanical gardens in your own state? Share the website in the comments below. I’m always looking for new inspiration! 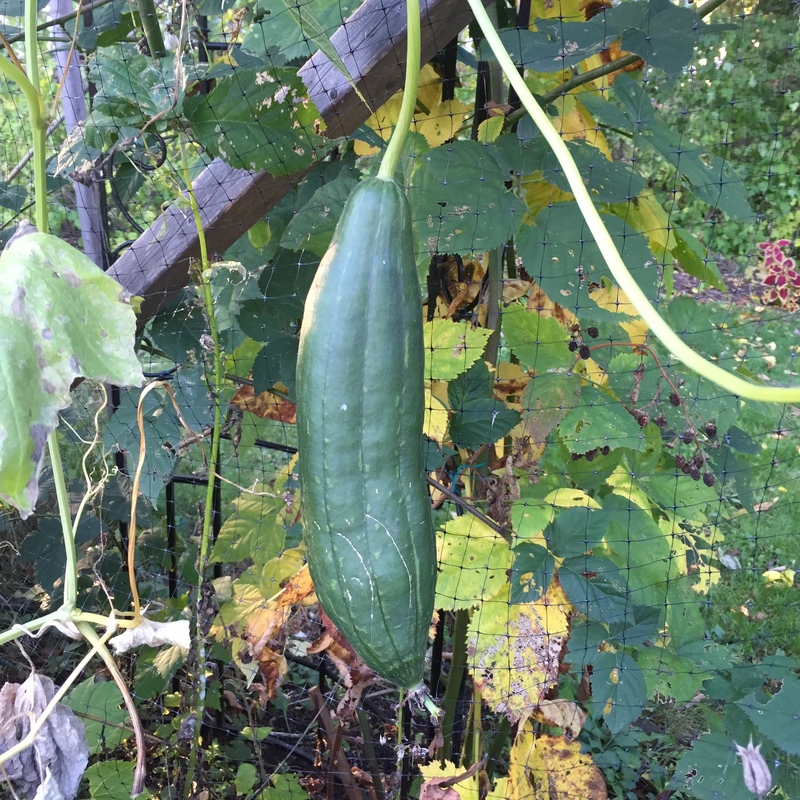 My loofah plant is exceeding all of my expectations for what a plant grown in a shady Ohio yard can achieve. It is the largest plant I have ever grown from seed. I garden for the simple joy of watching plants grow and this plant has been thrilling to watch as it takes over my fire pit, kindling pile and everything else that gets in its way. 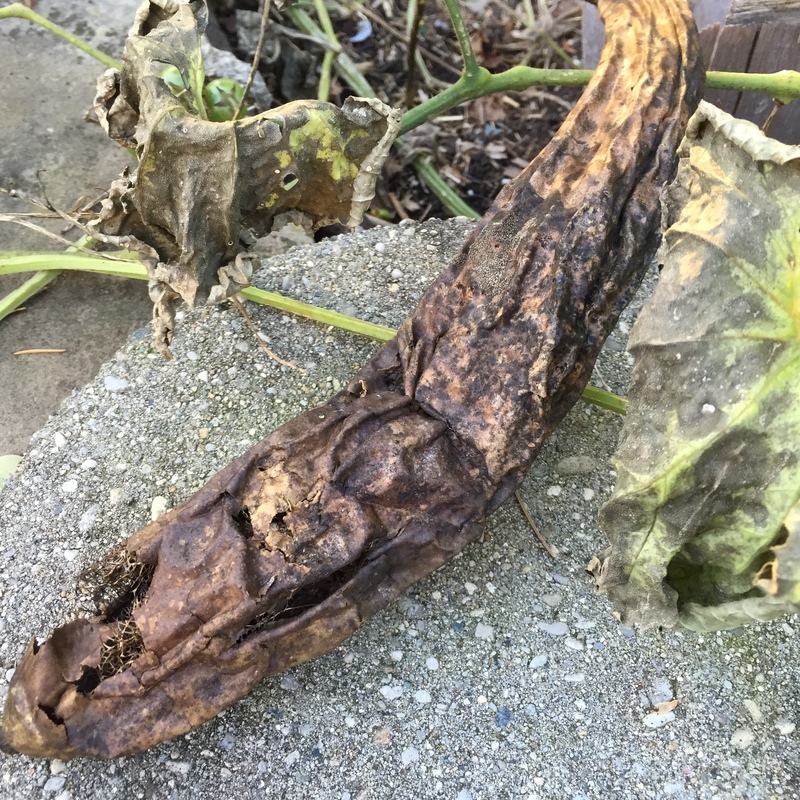 When I planted the seeds earlier this year, I hoped for at least one loofah that would be big enough to dry and use in a soapy creation. 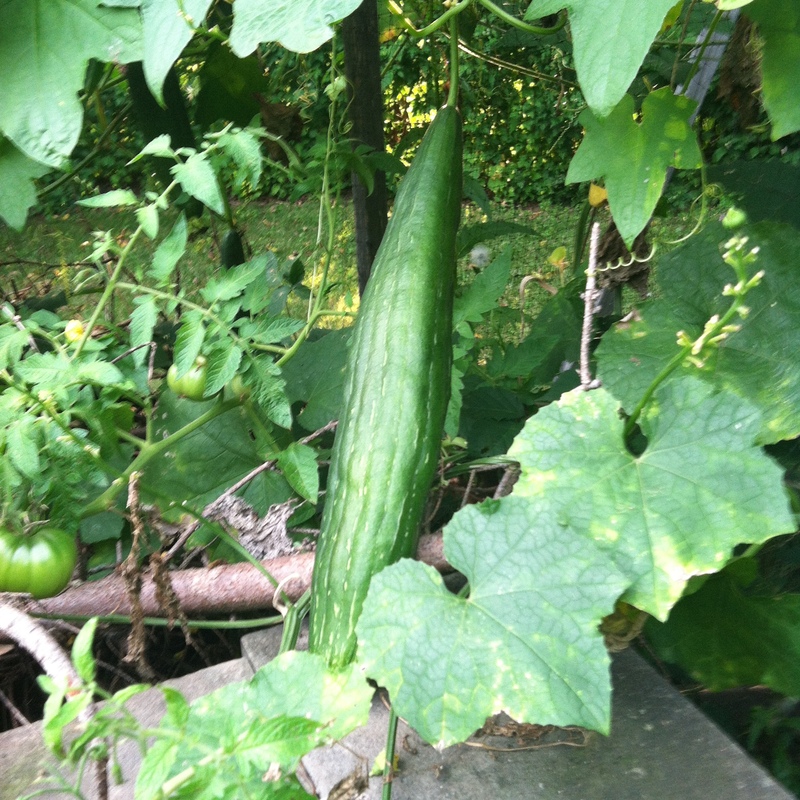 At last count, I have nine loofah and the largest currently measures 18 inches! Bubba may have found a million different ways to prepare loofah but when it comes to home-grown veggies, I prefer a simple preparation with very few ingredients. 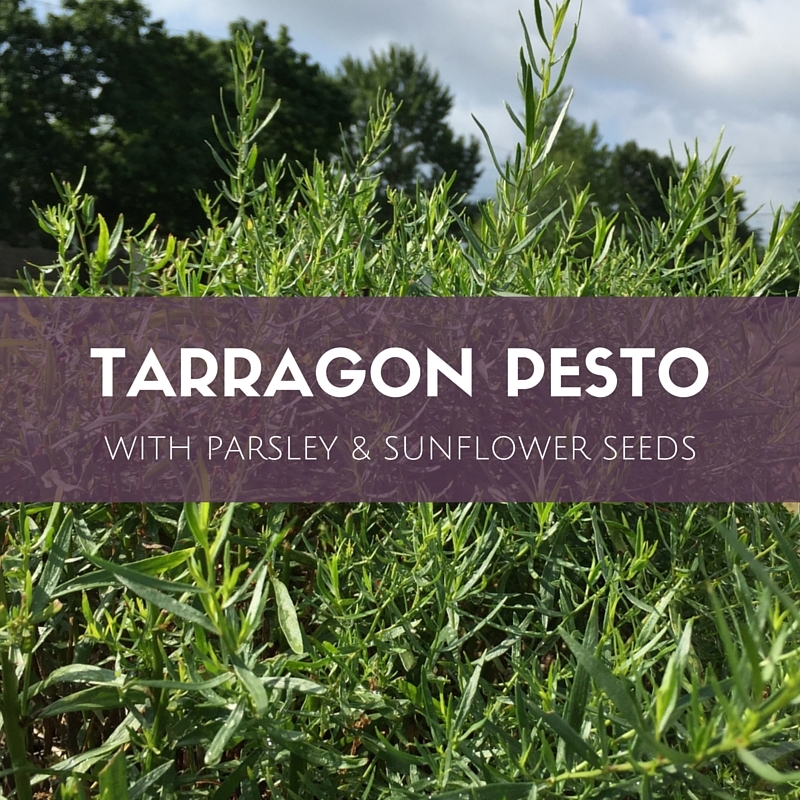 I want to experience the flavor and character of the vegetables that I grow. 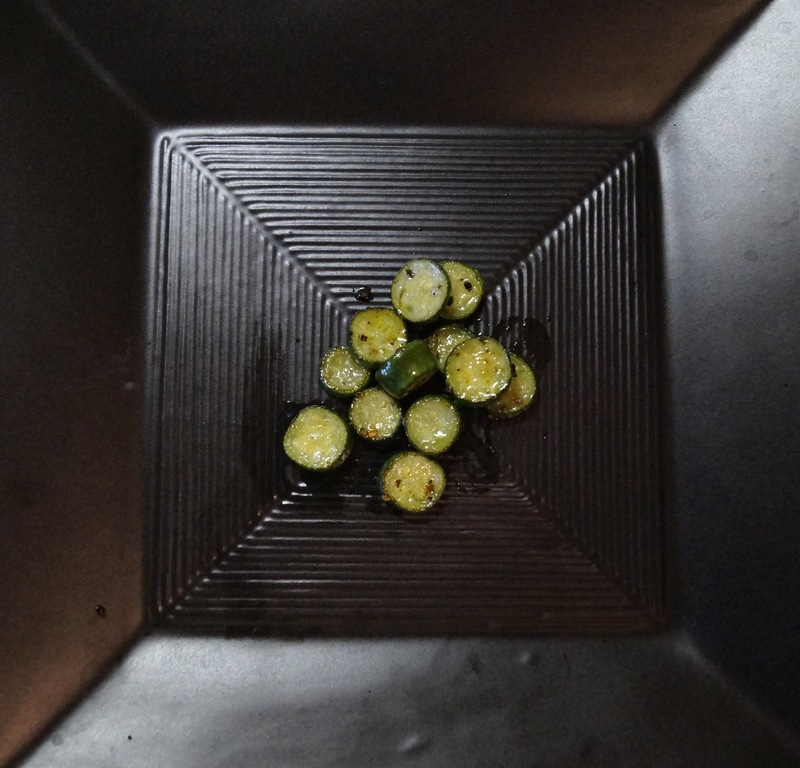 When I cook zucchini, I sauté it with olive oil and a pinch of garlic and then season it with salt and pepper. That preparation seemed like the easiest choice for my first foray into eating loofah. 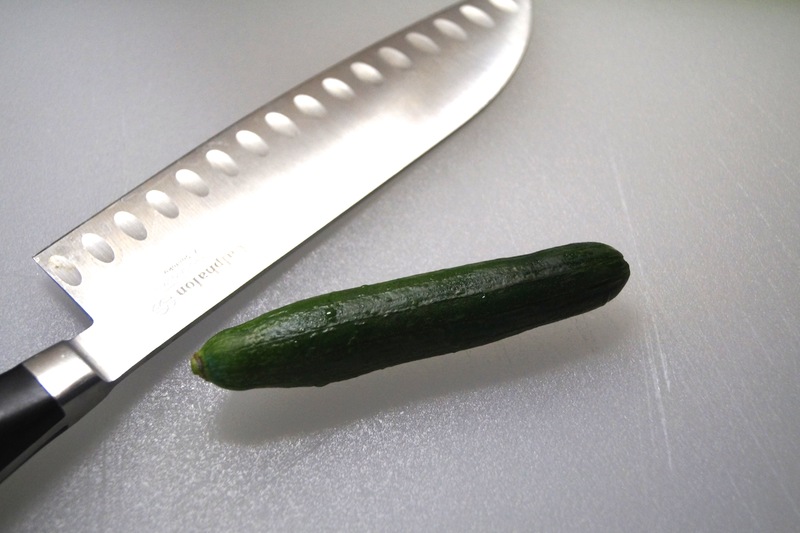 The first chance I had, I picked a tiny baby loofah, cut it up into chunks and sautéed it just like I would a zucchini. My only regret is that I didn’t pick more so that I could try other recipes like this Thai stir fry called Buab Pud Kai. 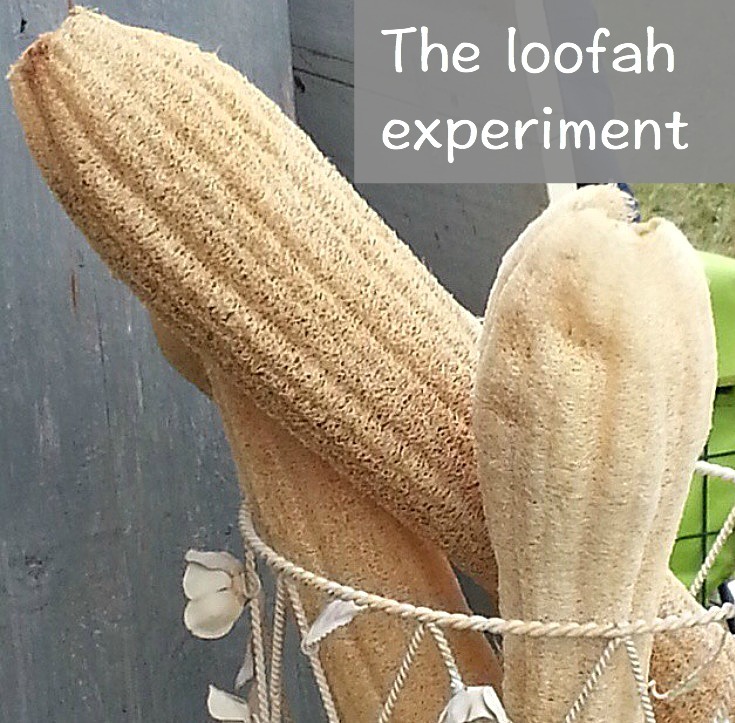 Have you seen loofah sold in markets where you live? Have you tried it in a recipe? Tell me all about it in the comments and share your recipes!